It's kind of ironic that when I was younger and had that youthful complexion I spent more time thinking about high quality makeup, and since I worked full time, it was rare that I left the house without it. 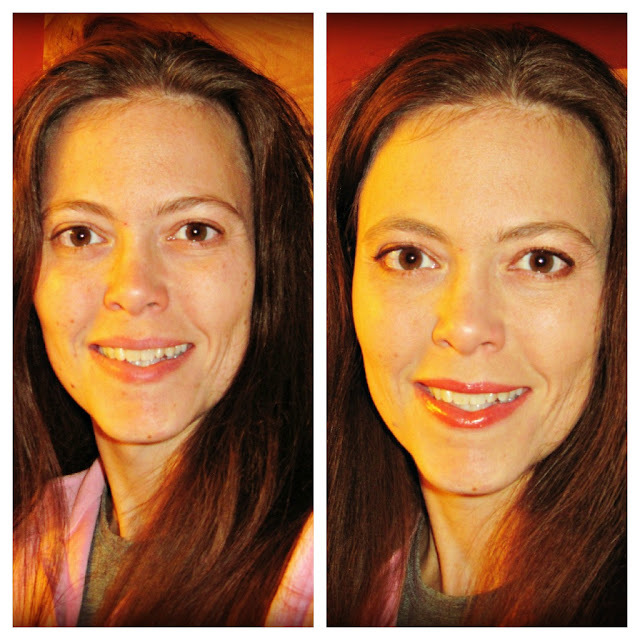 Now, with three boys and living on such a small budget, makeup has kind of been on the back burner for me, but I definitely need it more now than I ever did when I wore it daily. I was so excited when I was approved to do a review and giveaway of the Mia Mariu products. They have so many beautiful choices in makeup and skincare that I had a very difficult time in choosing. Because of sun spots on my face, I felt like I needed a concealer most of all, and I decided to try the Mineral Cream Concealer in Miel. I love how lightweight and long-lasting it is, and it doesn't take much to even out the tone of my skin. I also ordered the hydrating stick gloss in Caricia. I was pleasantly surprised by how silky and smooth it feels upon application - and it doesn't dry out my lips like other products often do. This color is more pink than I expected, but I love soft look it creates. The final product I chose is the Mineral Eye Shadow in Rosa Marquesa. I like that the shadow doesn't seem to fade throughout the day - it stays put. The color seems very natural to me, and the best part? It doesn't irritate my sensitive eyes or bother my contact lenses. Below you can see the before and after pictures. The only product I used besides the Mia Mariu products pictured above was a little mascara. The look itself came together so quickly - it only took me about 3 minutes! I did use my own eye shadow brushes instead of the ones provided. Mia Mariu offers a wide assortment of makeup brushes as well. Can you believe the difference in my skin? I don't look all washed out anymore - and I love how it doesn't feel like I'm even wearing makeup. These products are truly high performance, and I felt fantastic wearing them. Not only that, but they are so easy to use (and haven't broken out my skin like some products do) that I can certainly see myself using these on a daily basis, especially since the colors I chose create such a natural look. Now the best news? One lucky winner will win one of each of the products above! Not only that - but the winner gets her choice of colors as well! If you'd like a chance to win, just enter through the Rafflecopter below. Good luck! I'd love to try the concealer. Every product in the world gives me break outs. This really looks like a wonderful product line. Really evens your skin out nicely. I would be curious to try - I think I will go check it out. Thanks! I don't wear any makeup!!! You look beautiful in both pictures!!! I love mineral makeup! It covers so well yet feels as if you have no makeup on at all! Oh, you do look lovely in both pictures, but I can tell the difference. Nice stuff! Well I hope I win this one. Mary won one. Now perhaps my turn. I could use it, that's for dang sure. It snowed here but not very much, but the temps are cold! You look great! You look lovely without makeup, though. You look amazing. Oh, my, I think I'm going to have to google that makeup. Looking good, with or without! I don't wear make-up everyday. I have very sensitive skin. Looks like a great product line! That shade of lipstick looks so great on you! Makeup becomes you and I think some women need just a light touch of it even though they say they don't have time or they don't want to or whatever excuse. No one has flawless skin and makeup can just smooth things out and make an improvement. I certainly need it! You look great either way!! You look great in the before and after photo. I only wear makeup a few times a year. 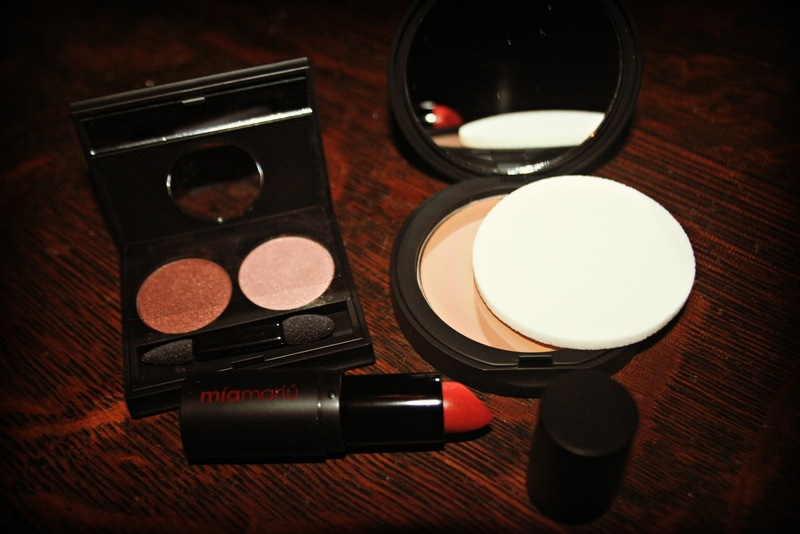 I have tried Mia Mariu and they do have the best mineral makeup around. I think it looks very natural. At my age a good concealer is a must! I'd love to try their lip gloss! Thanks! I forgot to say that "yes" I would love to be entered in this giveaway! I would try the cream foundation in light and one of the blushes. However, many of their skincare items sounds lovely. It does look good. Surprising what a little make up does. I know nothing about makeup but I like the way it looks like you don't have much of it on and you still get the desired effect. I see girls who look like the feel into a bucket of the stuff, in my artist opinion, the less you can use the better. That lipstick looks amazing! I want it! I'd love to try any of the products. I'd start with the Primer and the Hydrating Stick Gloss first. Thanks! Looks like a great product line. You look fantastic, by the way. You are gorgeous either way! I would like to try their liquid foundation. I like the touch up compact kit! I would like to try the Anti Aging Moisturizer from Mia Mariu! I like the deluxe touch up kit!